I was lucky enough to recently attend EA’s Studios in Guildford to get my hands on the brand new FIFA 14: Ultimate Team. Check out here my preview of FIFA 14: Ultimate Team, my video previews and my interviews with Producer Sebastian Enrique and Marcel Kuhn and also how EA will continue its fight against Ultimate Team coin sellers in FIFA 14! 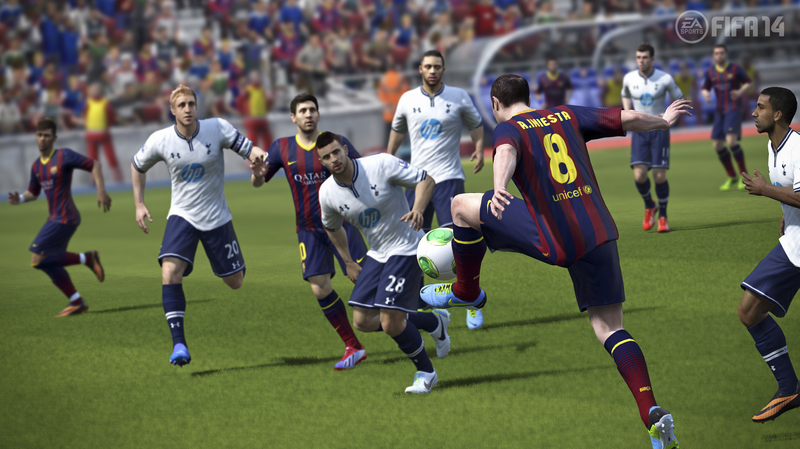 One of the major new additions to Ultimate Team in FIFA 14 is Chemistry Styles, something that the Producer on FIFA 14 Ultimate Team, Marcel Kuhn, feels will add another layer of personalisation. These styles will affect attributes, depending on what style is applied, and will gain an even greater boost if applied to a player who has good chemistry. This additional boost will be evident on the card in a bid to increase transparency. 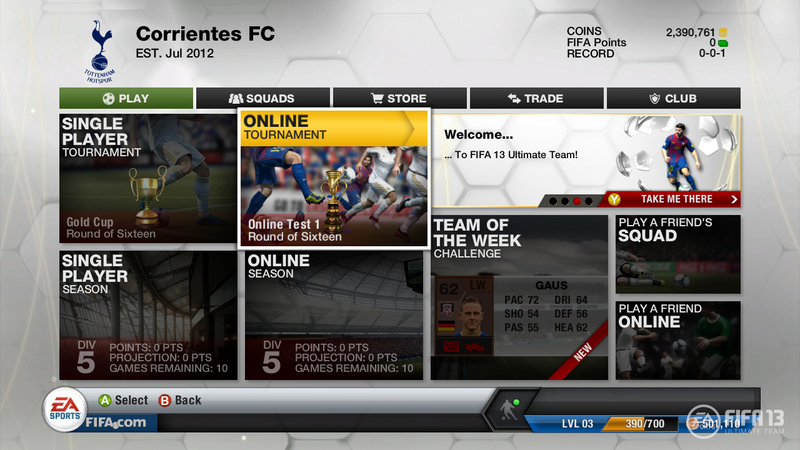 A quick look at the Gold Ultimate Team Pack for FIFA 14 and the Squad Layout screen. 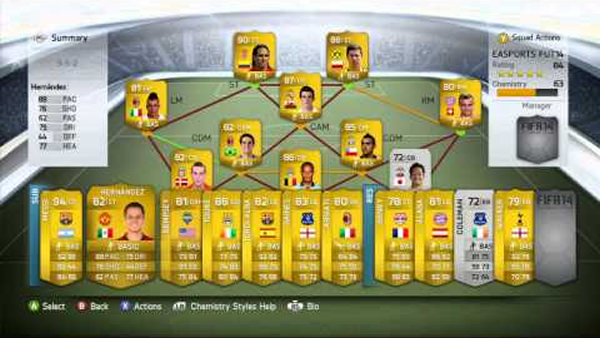 My FIFA 14 Ultimate Team News – Coin Sellers Beware! Watch out! EA is coming for you and will not support the practice of selling Ultimate Team coins in FIFA 14. With Gamescom just around the corner, EA is preparing for some more FIFA 14 announcements, but I sat down with Producer Sebastian Enrique to try to tease some information out of him regarding what is in store for players. You announced Bale as the cover star of the UK & Ireland; have you insider knowledge with regards to where he is going to be next season? After each match, it comes up with ‘EA Sports Football Club Recommends.’ What can we expect to see in this? On the licensing front, congratulations on the 19 Brazilian teams. What kind of decisions are made with regards to which licenses you try to acquire? Skill games was one of the new features introduced last year; how many are in the game this year? At the top end it gave players a taste of what manual controls were like; did you see a lot of players switching over or changing some of their commands to manual? You want people to be able to play their way and create goals in different ways, but when the online community gets their hands on the game they use one tactic that works better than others; what kind of changes have you made so that players can play their own game? How much tweaking has been done to the referee logic, because they’re going to be put under a lot more pressure with the physical side of the game? What do you think about community members who dislike that offsides are so black-and-white, yet complain about how referees interpret fouls? Will Kinect integration be coming back into career mode and putting people in the spotlight in the newspapers once again [for their potty mouths]? Seasons has always allowed players to use different rated sides, so is there any desire to change it so that people will have their 5-star division, their 4-star division, all the way down to a 1-star division? That they have separate Seasons Career Modes in a way? The aerial battle has been a bit of a lottery at times, and obviously you’re looking at that on next-gen systems with the Ignite Engine. Have you been able to do tweaks for current-gen systems as well? You’ve added a few new features; which one are you most proud of? I sat down with Ultimate Team Producer Marcel Kuhn to see how the game will change this year and what future announcements we could hear about. The locomotive engine is one of the big new features of FIFA 14 and looks set to change how people approach games. How will this affect Ultimate Team, which is typically quicker than the regular game? And will it slow down the pace of the game? Can you talk more about the Chemistry Styles, how many there are and how they influence gameplay? Are you a little nervous that people will gravitate towards pace? Will players come with a base chemistry style from packs or if people resell them? As the name implies, it’s all about building your Ultimate Team; for some this is a bronze or silver team, so is the Seasons mode going to be switched up to allow them to use these teams or do players have to build their gold star-studded squad from the start? Recently we’ve seen Blizzard and Valve embrace the idea of in-game trading or selling. Is there any plans to legitimise the coin-selling industry that has cropped up on eBay and other sites? We don’t quite know time frames yet, but will it be possible to start your team on one system, a current-gen system, and then continue your progress on the next-gen, assuming you stay with the same manufacturer? As you’ve pointed out, Ultimate Team has been incredibly popular throughout its history. Will the servers be ready for the pressure this year? You mentioned in your presentation that you suffered a 5-1 loss recently; there’s some that wouldn’t stick this out. How do you strike a balance to allow people to forfeit so that they don’t et hammered without tainting the other person’s experience? With the difference in gameplay style and speed, there have been people asking for manual filters or specific cups. Have you tried to encourage that especially as manual might have become more popular thanks to the introduction of skill games? Last year saw the introduction of the Football Club catalogue. Have players taken advantage of the boosts that were there for Ultimate Team and will it be returning this year? So with the Protect the Ball, the Locomotive engine, the various shooting styles, there are a lot of new ways that gamers can play. What players or types of players do you think will be most popular this year? So what do you think of my preview, videos and interviews and please ask away if there’s anything you’re curious about FIFA 14: Ultimate Team that I might be able to answer.